I maintain that “Split” is a wildly uneven film; the film’s third act completely derailed for me but I’m fine with James McAvoy’s impressive performance. 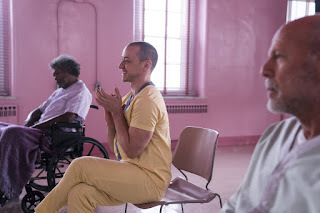 So how does one discuss “Glass” without spoiling “Split?” Just by virtue of existing “Glass” spoils “Split” if you haven’t seen it. The twist of “Split” is that its actually set in the same world of M. Night Shyamalan’s post-“Sixth Sense” film “Unbreakable.” “Glass” brings characters from “Split” and “Unbreakable” together to create a completely fine film; it’s not horrendous, it’s not magnificent. It’s easily middle tier Shyamalan as that’s what he’s been churning out lately. Those seeking something on the level of his greatest work “The Sixth Sense” need not apply. “Unbreakable” was a film audiences weren’t quite ready for nor what we were expecting. I recall having an oddly cold reception to it as most did. But over time it’s reputation has grown, especially in a market overrun by comic book films. No one was expecting a real life comic book tale from the guy who made a scary ghost movie about a kid who sees dead people. And what a better time to revisit the world of “Unbreakable?” “Glass” works as a sequel to “Unbreakable” but I’m not sure it works as a sequel to “Split.” Though generally find it more of a success than that film. The storyline involving Anya Taylor-Joy’s kidnapping survival heroine Casey is sort of needless and uninteresting. Revisting a character who has underwent a psychological trauma is interesting but “Glass” doesn’t do anything interesting with it. The film’s real successes lie with Bruce Willis’ character David Dunn and his young adult son Joseph (Spencer Treat Clark) who has sort of become the Alfred to his Batman. Anyone expecting any sort of traditional super hero narrative is going to be wildly disappointed. The film spends a majority of the story as our three main characters spend time being studied in an institution. That includes master criminal, who started this whole thing, Elijah Prince aka “Mr. Glass” played by Samuel L. Jackson. New to the series is Sarah Paulson whose character is a psychiatrist who specializes in disorders in which people think their superheroes. That’s all fine and dandy but it’s the scenes before David is captured that truly thrill while the film spends too much time psychoanalyzing its characters. And the film’s final act is sort of a mixed bag, I can’t imagine most audiences will be thrilled with how everything plays out.